The third entry in my series of blog posts about Favorite Astro Plots contains one of the biggest discoveries from the Apollo program -- as well as one of the biggest questions in planetary science. The chart was nominated by planetary scientist Barbara Cohen. It has to do with the ages of surfaces on the Moon. The Moon is the only world other than Earth from which we have brought back a large number of samples whose original locations we know. Most of those samples are volcanic rock. We can determine the ages of those rocks in the lab using laboratory analyses of the presence of radioactive elements and their decay products. That lets us age the volcanic flows that the rocks came from, allowing us to determine the ages of large units of volcanic lunar rock. On the x-axis, you have time before present, in billions of years; it's a linear scale. On the y-axis is the cumulative number of craters larger than four kilometers in diameter found in one square kilometer of lunar surface. From Heiken et al. 1991, Lunar Sourcebook: A User's Guide to the Moon. Returned Apollo samples can tell us about the rate at which the Moon's surface has accumulated craters over time. For more information, read this blog post. The younger ages are from nearby craters that threw out impact melt rocks to the Apollo sites, but the tie to the source is more tenuous, and the number of craters is fewer, so the error bars are much larger. What this kind of plot gives us is a way to extrapolate absolute ages to places on the Moon that don’t have samples that we can date. We can count craters and then go from that crater count over to the line, and drop down to the actual age. It’s pretty powerful for just that. But we also extend it to pretty much all other planets, because we don’t have samples from those planets tied to crater-counted surfaces. So that makes it even more powerful. That’s why it’s my favorite plot. So the rocks brought back from the moon, in combination with geologic mapping, allow us to date any surface on the Moon. That's very powerful. To extend it to other terrestrial planets like Mercury or Venus, we have to make some adjustment to account for the different number of asteroids we expect to hit it. For instance, Mars is larger than the Moon (so has higher gravity, attracting more impactors), and is also closer to the asteroid belt (the source of all those impactors), so a Martian surface that's the same age as a lunar surface would have more craters; mathematical modeling suggests about 1.5 to 1.6 times more, Cohen told me. But the shape of the curve should be the same, because the population is the same -- the asteroid belt. To use these curves for surfaces outside the asteroid belt, like the moons of Jupiter and Saturn, you need to think about the different population of objects in the Kuiper belt. That's one reason it's worthwhile to discover faint objects in the Kuiper belt; we're seeking to learn the proportion of larger objects to smaller objects, so we can understand what the populations of impact craters should be on the surfaces of outer solar system worlds. The fit line is a line of constant production of craters. The plot has points at both young and old radiometric ages, so we can make a nice fit using a constant-production assumption. But, as you can see, the data appear to go sharply up at the old end, while the fit line doesn’t predict that. That means that earlier in time, there was an increased production of craters. We might expect that, if we think that the solar system used to have more debris whizzing around from planet production, large impacts, etc. So extrapolating that line upwards seems reasonable. But if you do that, you predict so many craters at the very old ages that if you add up the mass of material hitting the Moon, it’s comparable to the mass of the Moon itself. That clearly didn’t happen. So we have a mismatch. To explain the mismatch, people proposed the Late Heavy Bombardment, or more properly in this case, the Terminal Lunar Cataclysm. 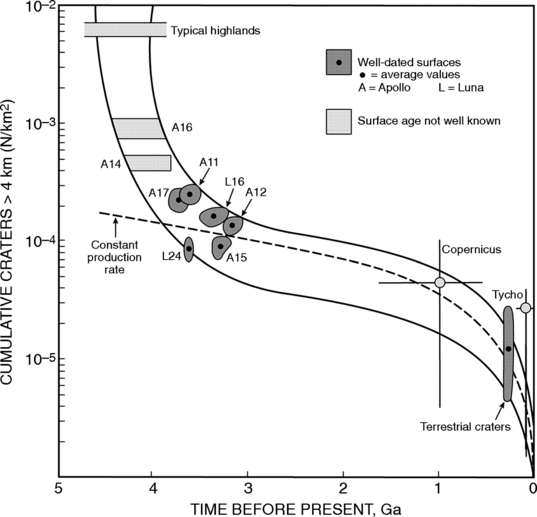 This hypothesis says that there was a short period of time when there was an increased production of craters around 3.9 billion years ago. We see evidence for this explanation in the lunar samples themselves, a great number of which were metamorphosed around this same time. If it were a temporary phenomenon, then we’d get this graph and the samples, but the extrapolation would go back down to the “constant” production curve by about 4.5 billion years ago. That’s why people sometimes talk about a “spike” on the flux curve. This is still a hot topic of scientific debate and research! While it’s a good explanation, it’s hard to know what would have caused it. We must have had a very dynamic solar system at the time. It’s a fun field to be in right now, when we have the ability to work on smaller and smaller samples, with more and more advanced techniques, along with LRO images that give clearer crater counts on better-defined surface units and also bigger computers with more CPUs to run more sophisticated models of solar system dynamics. Geologic mapping of the Moon after Apollo and Luna showed that it's possible that many of the samples we have from the Moon could be contaminated with ejecta from a single giant impact, the one that created the Imbrium basin. That could explain the cluster of ages around 3.8 billion years old. It would be great to age-date a sample from the Moon that's from a location that contains older rocks that are less likely to be affected by Imbrium ejecta. One such location is the South Pole-Aitken basin, on the lunar farside, which is thought to contain lunar mantle material near its center. An age-dating mission sent there, or a sample returned to Earth from there, could answer some of the questions we have about when these major solar system forming events took place. Thanks, Barbara, for sharing your favorite astro plot! If you're a researcher who'd like to tell me a story about a favorite plot of yours, send me an email! NASA via Kipp Teague's Project Apollo Image Gallery web site. Processing by Tom Dahl.